The following is an exclusive to Inside KSC.com by Debra Richbourg Wolfard, and may not be distributed to any other sources without the expressed written consent of the InsideKSC.com staff. A group of Kennedy Space Center-area space enthusiasts developed a plan to handle a tricky bean situation on July 1 after STS-121 failed its first launch attempt due to unwieldy weather. No, we're not talking about an unexpected visit by former astronaut Alan Bean, although the group would certainly welcome him to an after-launch celebration. The beans we refer to are NASA Launch Beans, a tradition begun with STS-1 back in 1981 by then-NASA test director Norm Carlson. The story goes, according to thefiringroom.com, that during the endlessly long work hours prior to the first shuttle launch, employees began bringing in covered dish meals to share. Carlson's contribution was a crock pot of beans, accompanied by corn bread, which quickly disappeared after STS-1's launch. His beans-and-corn bread became a part of each successful launch. Hearing about the bean-and-cornbread tradition, we decided to make it part of our post-launch celebration, and I volunteered to research and develop the bean project. Actually, I thought it would be relatively simple, since I'm a fairly experienced cook. But just like many other space related projects, there were unexpected pitfalls along the way. First, we needed the authentic recipe. One member of the group emailed me a recipe she had found online, which proclaimed itself to be "Norm Carlson's Space Beans Recipe." No problem, I thought. But wait--the recipe was cryptic (what the heck was 1/2 shaker of lemon pepper? ), and the measurement quantities given (six pounds of dried beans, ten pounds of ham) were more appropriate to serving masses at NASA than our group of expected guests. I compared it to other bean recipes in my cooking bible, The Joy of Cooking, only to find I'd have to translate the measurement quantities from pounds to cups in order to arrive at a dimensionally appropriate amount. After all that, it was simple to assemble the ingredients and determine when to start the pot cooking so it would be ready for the after-launch gathering. However, delivering a full hot crock pot of beans to its destination, including transferring it from my trusty personal crawler-transporter to a van rented for the launch took some unusual methods not likely food-industry standard. Finally we had everything in place and headed out to NASA Causeway on Kennedy Space Center, where thanks to one KSC employee in the group, we were to watch the STS-121 launch. Unfortunately, as we all know, the launch that day was scrubbed due to insistent anvil clouds. Disappointed but hopeful for launch the next day, we were now faced with a real dilemma. The group consensus was that it would jinx the next launch attempt to eat the beans when there was a scrub, yet it would have seemed half-hearted to have formed a backup plan, as if we really didn't expect it to happen. So there we were with a bunch of hungry people and a large pot of beans that we couldn't eat. Discussion ensued, along with drinks, and a plan was proposed. 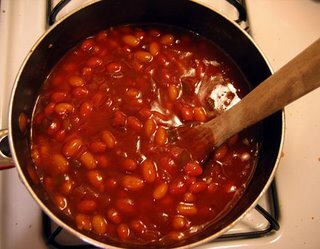 If we altered the beans in the pot by adding additional ingredients, then they were no longer authentic launch beans, and we could safely consume them without bringing down bad luck. Our host raided the pantry, produced three cans of different beans, added them to the mix and promptly dubbed them "Scrub Beans." The beans, at least were "go". As we know, the launch was called off the following day due to heavy rain, and the third day was a stand-down for crew rest. But Discovery went on to a beautiful launch on the fourth day, the first ever on our nation's Independence Day, so we think our plan worked. Cover with water in an 18-quart electric cooker and cook 8-12 hours. Cover all ingredients with water in a large crock pot (about 6-8 quart) and cook for 8-12 hours. Enjoy the launch, enjoy the beans (we think they may help fuel the rockets) and don't forget the corn bread.